The subjects were enrolled in the Arterial Biology for the Investigation of the Treatment Effects of Reducing Cholesterol 6-HDL and LDL Treatment Strategies in Atherosclerosis (ARBITER-6-HALTS) trial.4 The study patient population selection, methods, and results have been previously described.4 The inclusion criteria for study subjects were age ≥30 years; with known atherosclerotic cardiovascular disease or coronary heart disease equivalent; taking statin monotherapy at a consistent dose at the time of enrollment; low-density lipoprotein (LDL) cholesterol (LDL-C) <100 mg/dL (2.6 mmol/L); and high-density lipoprotein (HDL) cholesterol (HDL-C) <50 mg/dL (1.3 mmol/L), in men, or HDL-C <55 mg/dL (1.4 mmol/L) in women, documented on a lipid panel within 3 months of enrollment. For the purpose of this study, baseline and 14-month follow-up CIMT studies from a single site of the ARBITER-6-HALTS trial were evaluated. The protocol for CIMT assessment has been described previously.5 In brief, the mean and maximal diastolic CIMT of the distal 1 cm of the far wall of the right and left common carotid arteries were measured. A single sonographer obtained four views of the right and left far wall common CIMT using a 13 MHz ultrasound probe. The carotid ultrasound examinations were performed at baseline, 8 months and 14 months. The baseline and 14-month images were blindly reviewed for the presence of a TLP. The TLP was assessed as absent (0), possible (1), or definite (2) in each of the views. It was defined as an additional interface, visibly apparent between the intima media component of the common carotid artery (Figure 1). A composite score from all four views was calculated, and a patient was considered to have the TLP if this score was ≥4. Figure 1 CIMT images showing sample patients in whom TLP (arrow) is absent (left) and present (right). Note: There is a visible horizontal interface between the upper and lower CIMT border. Abbreviations: CIMT, carotid intima media thickness; TLP, triple line pattern. In order to assess for intraobserver differences, the same observer reviewed a subset of the 14-month ultrasounds again after 1 year. Each ultrasound was graded for TLP as: absent (0), possible (1), or present (2). The scores assigned to 81 out of 88 images (92%) were within 1 point of each other (P<0.001). We also assessed for interobserver differences. Two observers graded 20 ultrasounds. The scores assigned to each image were within 1 point of each other in 18 of them (90%). The prevalence of the TLP in our study population was determined first. Subsequently, univariate predictors of the TLP were explored. The prevalence of the TLP at baseline, and at 14 months, were compared using the two-tailed t-test. Univariate analysis was used to assess for differences in cardiovascular risk factors at baseline, compared with 14-month follow-up. Continuous variables were evaluated using a t-test for independent variables, or a Mann–Whitney U test, as appropriate. Categorical variables were evaluated using the chi-square test. A two-sided P-value≤0.05 was considered statistically significant. SPSS version 16 statistical software (IBM Corp, Armonk, NY, USA) was used for all statistical analyses. A total of 120 subjects were evaluated. 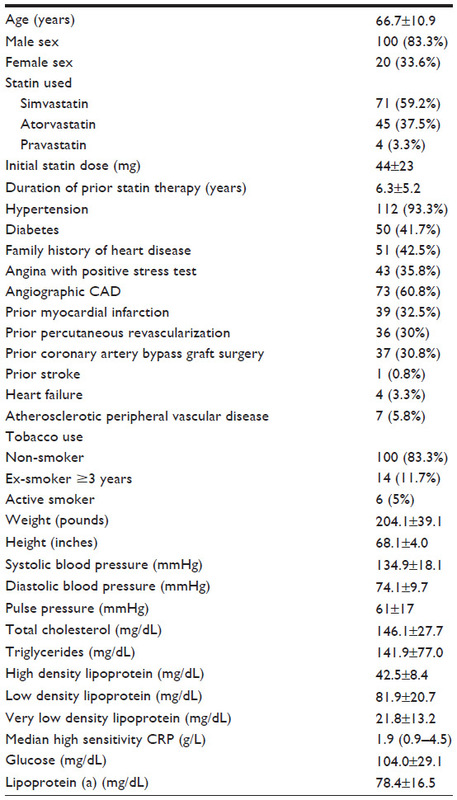 Baseline characteristics are shown in Table 1. The mean age of the subjects was 66.7±10.9 years. Hypertension was present in 93.3% of the subjects, and 41.7% had diabetes. All of the study patients were on statins, for a mean duration of 6.3±5.2 years prior to enrollment. Simvastatin was the most prevalent statin (59.2%). Among this patient population (on lipid lowering therapy), the prevalence of the TLP was 22.5% (N=27). Note: Totals presented as either mean ± SD or percentages. Abbreviations: CAD, coronary artery disease; CRP, C-reactive protein; SD, standard deviation. The presence of the TLP, and its association with cardiovascular risk factors, were explored, including LDL concentrations, dosage of statin, baseline CIMT, blood pressure, height, and weight (Table 2). The only significant association was between the TLP and systolic blood pressure (SBP). The mean SBP in patients without the TLP was 133.1±18.4 mmHg – versus 141.3±15.6 mmHg in patients with the TLP (P=0.04). There was no statistically significant difference among those with and without the TLP for HDL-C, LDL-C, C-reactive protein (CRP), glucose, weight, or waist girth. The presence of the TLP was also unrelated to CIMT or image quality. Abbreviation: TLP, triple line pattern; CRP, C-reactive protein; CIMT, carotid intima media thickness; SD, standard deviation. 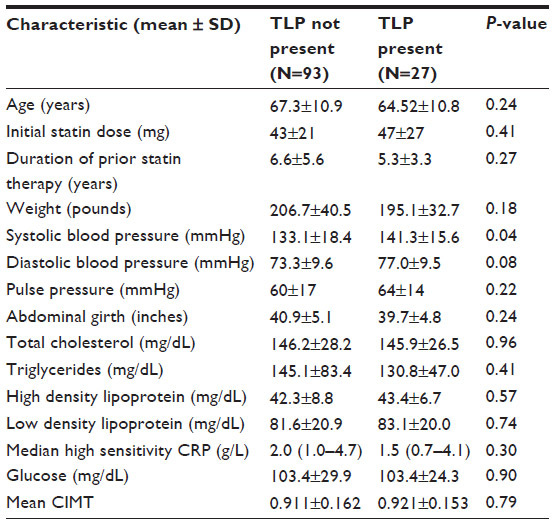 During ongoing lipid lowering therapy of 14 months, the prevalence of “definite” TLP increased to 54.2% (N=65; P<0.001, compared to baseline) (Table 3). This was unrelated to changes in lipid concentrations or other cardiovascular parameters. The SBP at 14 months was 130.6±15.3 mmHg, in the group without the TLP, and 133.21±33.5 mmHg in the group with the TLP (P=0.715). The diastolic blood pressure was 71.0±8.83 mmHg in patients without the TLP, and 73.21±9.0 mmHg in those with the TLP (P=0.715). When the 14-month group was further divided into those who had lost the TLP, who had no change in TLP status, and who gained the TLP, the LDL values were 69±3 mg/dL, 66±20 mg/dL, and 76±24 mg/dL, respectively (analysis of variance [ANOVA]: P=0.13). The HDL values were 42±7 mg/dL, 44±11, mg/dL and 42±9 mg/dL, respectively (ANOVA: P=0.50). Abbreviation: TLP, triple line pattern. We found that, in this sub-group of the ARBITER-6-HALTS trial, a patient population with underlying coronary heart disease or equivalent, and undergoing lipid lowering therapy, the TLP was found in approximately one in five patients, and was related to higher SBP. Interestingly, during ongoing lipid lowering therapy, we noted an increased prevalence of the TLP, independent of changes in several cardiovascular parameters. In the only prior study of the TLP, conducted among Russian men,3 it was found in approximately one in five individuals (20.8%), and associated with age, SBP, total cholesterol, smoking, and any alcohol consumption in the past year. We found a similar prevalence of the TLP, and an association with blood pressure. However, we could not confirm any associations with other cardiovascular risk variables. The clinical significance of this ultrasonographic appearance of the carotid artery is unknown. It is interesting that, in a general population of Russian men,3 the TLP was found to be prevalent more in patients with hyperlipidemia and increased CIMT; but in our patient population, there was not a statistically significant association between these factors. This may reflect the different patient populations, with our study being enriched by patients with cardiovascular disease and candidates for lipid lowering therapy. Furthermore, at the time of enrollment, our patient population had a mean LDL-C concentration of <100 mg/dL, due to pharmacotherapy, therefore, not reflective of baseline lipid levels. A recent study has suggested performing separate measurements of the intima and media components of the intima media thickness.6 Among individuals with high prevalence of inflammatory conditions, the relationships between cardiovascular risk variables and intima versus media thickness were different, although hypertension was related to thickness of both intima and media layers. Separate measurement of intima and media thickness requires advanced computerized analysis that is not available. Whether the TLP could represent a dynamic pattern within the CIMT is uncertain. Our study adds to our understanding by suggesting an increase in the TLP during ongoing lipid lowering therapy. However, this increased prevalence was unrelated to changes in lipid or blood pressure parameters. Future studies to evaluate the TLP within hypertension treatment trials would be interesting, to test our hypotheses regarding the association between TLP and blood pressure. This study’s predominant patient population was male; therefore, it may not be generalizable to female populations. Larger studies are needed to confirm our observations, including studies among trials of modifying cardiovascular risk variables. Whether or not this finding has any clinical significance or ability to predict cardiovascular outcomes requires further study. In conclusion, the TLP on CIMT imaging is identified in 22.5% of patients on lipid lowering therapy, in association with higher SBP, but not with other cardiovascular risk factors. The authors do not have any conflicts of interests or disclosures to report regarding the results of this study. Boutouyrie P, Gimenez-Roqueplo AP, Fine E, et al. Evidence for carotid and radial artery wall subclinical lesions in renal fibromuscular dysplasia. J Hypertens 2003;21(12):2287–2295. Park SH, Chung JW, Lee JW, Han MH, Park JH. Carotid artery involvement in Takayasu’s arteritis: evaluation of the activity by ultrasonography. J Ultrasound Med. 2001;20(4):371–378. Ryabikov A, Malyutina S, Halcox J, Nikitin Y, Marmot M, Bobak M. Prevalence and predictors of carotid wall triple line pattern in a general population sample. Arterioscler Thromb Vasc Biol. 2011;31(7):1682–1688. Taylor AJ, Villines TC, Stanek EJ, et al. Extended-release niacin or ezetimibe and carotid intima-media thickness. N Engl J Med. 2009;361(22):2113–2122. Devine PJ, Turco MA, Taylor AJ. Design and rationale of the ARBITER 6 trial (Arterial Biology for the Investigation of the Treatment Effects of Reducing Cholesterol)-6-HDL and LDL Treatment Strategies in Atherosclerosis (HALTS). Cardiovasc Drugs Ther. 2007;21(3):221–225. Bae JH, Kim WS, Rihal CS, Lerman A. Individual measurement and significance of carotid intima, media, and intima-media thickness by B-mode ultrasonographic image processing. Arterioscler Thromb Vasc Biol. 2006;26(10):2380–2385.